For the third (and perhaps not quite the last...) conversation about osmanthus I invited Lisa Fong of Artemisia Natural Perfume to discuss osmanthus from her unique experience of synesthesia of sounds, textures and colours and her creative process - starting from inspiration through raw material selections, to choosing the name. Please note: this conversation took place before the 2nd Artisan Fragrance Salon in San Francisco. Ayala Moriel/SmellyBlog: How would you describe the scent of osmanthus? Lisa Fong/Artemisia Perfume: Osmanthus smells like cherry, sugar, honey, and roots. AM: How fascinating to receive a completely different reaction from each perfumer in relation to the same scent. I've never heard anyone compare osmanthus to cherry or roots. Thank you for sharing! Have you ever smelled the fresh flowers? Ayala: You should try to get in touch with Ineke (note to self: I should invite her to the Osmanthus Conversations!) and see if you can coordinate a visit to her lovely perfumed garden when the osmanthus is in bloom. That was the only time I smelled it in real life - there were only a couple of little clusters, but they smelled amazing! Quite different from the absolute - which I think is more smiler to the dry flowers. Do you have any scent memories associated with osmanthus? Or memories that are triggered by this note? Lisa: Cherry cough syrup from my childhood. I think it was called Chericol, and I loved it. Ayala: What were the main challenges for you when incorporating this note into your perfumes? Lisa: Osmanthus is a weak oil and gets drowned out easily. I had this problem so I used a lot of osmanthus and used some black current absolute in the base to bring out the fruity notes. Ayala: That was my challenge with osmanthus as well - it feels as if the more you add, the less of it remains perceptible. I experience black currants as a top note though, with the characteristic sharp fruity edges wearing off very quickly. Lisa: I thought black current bud was a basenote. I could be wrong, but I like it in this blend. It seems to help push the osmanthus. Ayala: I think they are classified as such by Poucher - but find that even with volatility rates, the perfumer's perceptions vary - so I totally value your experience and perspective of it. Have you noticed anything unusual about the behaviour of osmanthus in a blend? Lisa: It is very complicated and it will tend to disappear. Ayala: Your osmanthus perfume is themed around apricot, a fruit that often is used to describe the aroma of apricot. How much of the apricotiness is real, and how much is suggested by the name alone? Lisa: For Saveur de l'Abricot, I used real, natural apricot essence. It was perfect with the osmanthus, which has a fruity quality, but also a sort of animalistic sense. I really like the fuzziness of the apricot and tried to bring that out by adding mango leaf essential oil. Ayala: Was this an apricot extract, or an apricot specialty? (note to readers: specialty is a compounded accord that is designed to smell like notes that would be difficult to extract in other methods). Lisa: I thought this was actually from the apricot,but after talking with Miriam of Robertet, I now think it is a blend of natural essences made to imitate apricot. Ayala: While we're on the topic - what's in a name? What part does the naming play in your creative process? Lisa: The name is the last and the hardest part for me. I never start with a concept, when I try it goes horribly wrong. I must stick to the scent itself and how I wish to develop it by adding other elements. When I finish, I try to write a description of the scent, and from that find a name that reflects what I think the scent is about. With Ondine, I felt the fragrance was watery and named it after the water nymph. Since then many people do not smell the water idea, but they like it anyway. Ayala: To me Ondine is like warm water - like hot springs. What an intricate process - it's almost as if you're going back and reflecting/assessing your creation in order to name it. In your mind, what is the role of the name, then? Lisa: I see the name as a way of summarizing the fragrance and what it is I tried to capture in formulating it. I find it is so hard to describe scent in words, it seems like an impossible task. The name is really important and I never know if I choose the right one. Ayala: How does your background as a musician affect your style of composition? Lisa: It has everything to do with my subconscious perception of the construction of the scent. Music is both intellectual and emotional. Since I have been a musician for most of my life, it is just a part of who I am. Order and logic are important, but I also like a bit of chaos and will toss in some strange ingredients to make the fragrance more interesting. Ayala: Do you feel or refer to scents in terms of vibrational frequencies, such as sounds or colours? Lisa: I always listen to music when I blend, and the music does influence the blend. I listened to Chopin when I made Eros. Now I'm listening to the Smiths, it will be interesting to see what I end up with. I've got some synesthesia and I associate scent with color and texture. For example, mango leaf smells green and fuzzy to me and frankincense seems sparkly with all the colors. Ayala: What inspired you to create Saveur de l'Abricot? What's the story behind it? 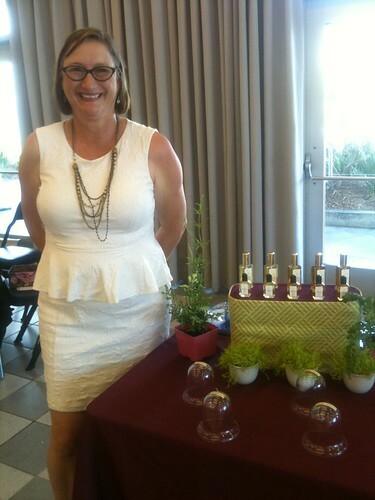 Lisa: Well Ayala, remember when you and I visited Eden Botanicals in Petaluma, last July? They had the most gorgeous osmanthus I had ever smelled. We both bought some even though it was so expensive. I decided to make a perfume from it and when blended with the apricot essence, the idea was formulated. And since then I met a couple other perfumers and their osmanthus scents, which lead to a more elaborate series of conversations. So - have you noticed a great deal of different between osmanthus essences from different sources? Do you have a favourite - and why? Lisa: Absolutely. I never cared for osmanthus because I had never smelled one I liked. The ones I had smelled like solvent, but the Eden Botanical osmanthus was a revelation. Ayala: We're fortunate to have a quality osmanthus, and I hope it will be around for a while. It's so wonderful it feels like you just can't get enough… Almost addictive! And since then I've done a few osmanthus experimentations that worked much better than in the days when I was struggling to create Kinmokusei. Since I have the new absolute, I added carrot seed, tea rose and pomelo tincture, which greatly improved the fruity, effervescent quality of the flower. Lisa: Your osmanthus blends sound fascinating, you always have such creative ideas. I would love to smell what you create. Thanks for letting me discuss my fragrance. See you in a few weeks! Ayala: More like a few days now! Looking forward to it. Thank you so much for sharing your insights on osmanthus and the creative process behind Saveur de l'Abricot!